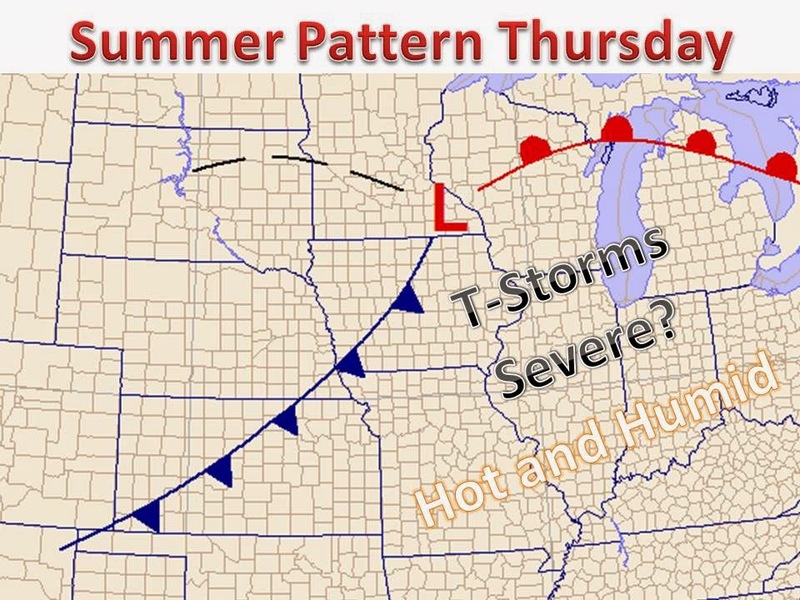 Midwest Winter Weather Blog: Summer Weather on the Way for Many! After a prolonged area of low pressure separate from the jet stream controlled the cool and active weather for the eastern half of the country, called a cut off low, a change is on the way. Temperatures will run above average by the middle of the next week, if not earlier. The jet stream will bump north allowing for warm southern air to filter in all week. An area of low pressure will develop and sift out of the Rockies and push towards the Midwest. Exactly where the track of the system falls will be a major factor for the weather in the Midwest next week. The map on the above is showing the current model consensus of where this system will be near on Thursday. 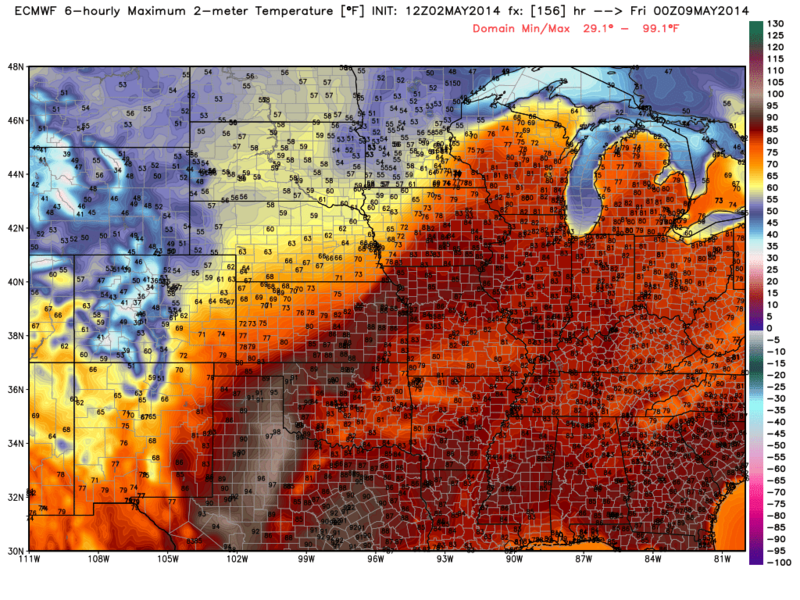 warm front) will see highs in the 70s and 80s area wide. This will likely be the first 80 for many in the Midwest. With dew points on the rise and ample surface heating, the atmosphere will become prime for severe weather, with CAPE values approaching 3000 J/KG from Wisconsin on south. A severe weather outbreak is certainly possible on Thursday in the warm sector and ahead of the cold front. We will have to see just where and when this system sets up. The 00z GFS (below) is firing up some thunderstorms for Thursday evening along the cold front. While the front will not bring much in the way of colder air, it will create necessary lift and convergence to develop strong to severe thunderstorms with heavy rains. Back to the temperatures, the chart above is forecasted high temperatures for late next week off the 00z GFS model run. Another temperature map is attached below coming off the European weather model, showing a major range of temperature across the Midwest. 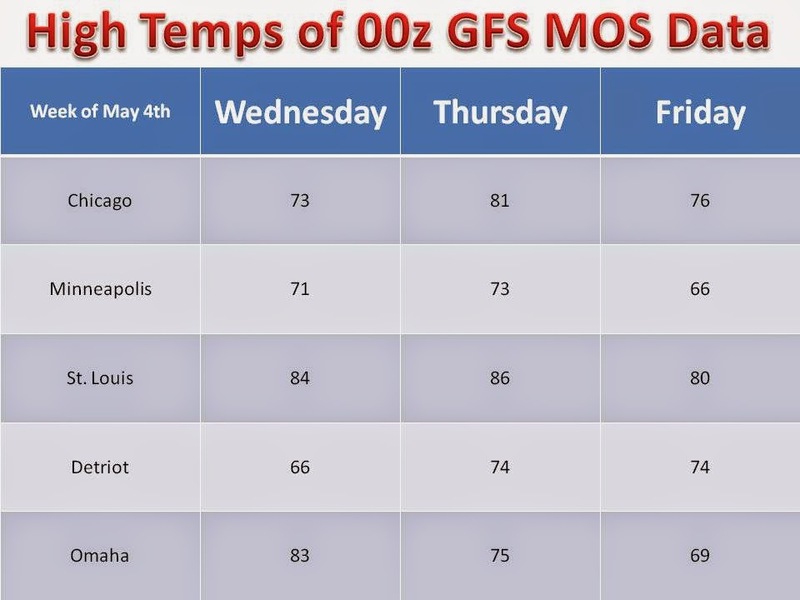 The barrier between warm and cool with depend solely on the track of the system mentioned above, either way warmer weather and a kick start to severe weather is on the way for the first full week of May.